The Baxia Technology Outdoor Solar Lights are a pretty reliable set of lights. They currently hold a 4.5 star rating on Amazon. While they may not seem like much on the surface, it is what is under the hood that makes them worth it. 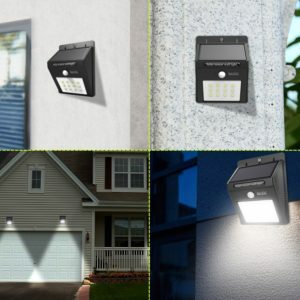 Like most outdoor motion sensor lights you will find on the market, these are pretty compact. The Baxia Technology outdoor solar lights size in at 4.9 x 3.8 x 1.9 inches and weigh 5.32 ounces. So mounting them on your outside wall will be no issue. They will not put any serious stress on the screws or your wall. While most outdoor solar lights include somewhere between 4 and 8 LEDs, this one has 12 LEDs. Each of those 12 LEDs has an output of between 22 and 24 lumens. Meaning the total output is somewhere around 260. However, there are some fixtures that have only 4 or 8 lights that put out the same lumen count. That means that these LEDs must be much lower than the standard. Nevertheless, 260 lumens is still a good brightness. But for 12 LEDs, I would have expected to see higher. To power these lights during the night, the Baxia Technology outdoor solar lights include a 18650 rechargeable 3.1V battery with a capacity of 1200mAh. This size of battery we have seen is the standard for motion sensor lights, as they do not remain on for very long. The solar panel included in these fixtures is actually surprisingly low. It only maxes out at 0.55 watts. There is no information provided about the conversion rate. However, it does claim that it requires 8 hours of solar charge to function for 12 hours. But it does not change the fact that the wattage from the solar panel is extremely low. The body of these lights is made out of plastic. It also has a waterproof rating of IP64, which is fairly standard for outdoor solar lights. Users have reported that the material is very sturdy and they have not had any real problems concerning it. These should be able to withstand whatever weather is thrown at them. Just be sure they are securely fastened on the wall using the screws. The Baxia technology outdoor solar lights only feature one lighting setting, which makes use of the motion sensor. There is no dim mode, which some might miss. However, due to the size of the battery and lumen output, this means that the lights will last much longer. Speaking of the motion sensor, it is a very basic PIP technology. It has the standard 10 feet sensing range and 120 degree angle. When motion is sensed, the lights will activate for 30 seconds, which is a nice amount of time. Baxia Technology is obviously a technology company. Their main focus is on lighting. They manufacture various models of solar lights, along with spotlights and string lights. Beyond that, they also deal in diffusers, bluetooth speakers, and other accessories. They have a global distribution network that spans over 200 countries. In addition, they also have a highly trained customer service professionals. So if you need any help regarding your purchase, they can assist you. They do sell all of their products through Amazon, instead of directly through their website. So it seems that Amazon is their sole marketplace. The 1200mAh capacity battery included in the Baxia Technology outdoor solar lights is capable enough for motion sensor lights. Since they do not remain on for a very long time, the battery does not need to be as big as some others. The whole light fixture is weatherproof, with a waterproof rating of IP64. They can hold up to heat, cold, rain, snow, whatever weather is thrown their way. As long as they are securely attached to the wall, you should have no issues in harsh weather. The motion sensor is very good. It has the standard range of 10 feet and angle of 120 degrees. There are no shortcomings when it comes to the motion sensor. There is no "dim" mode for the lights. They purely use the motion sensor, which reduces the need for a larger battery. The installation process for these lights is very simple. Screws and anchors are included with the package, along with expansion pillar-hinges. They automatically turn on at night, so there is no need to manually flip a switch. The 260 lumen output for 12 LEDs is surprisingly low. Many outdoor lights have a total output of 200 lumens with only 4 LEDs. While 260 lumens is plenty bright, it means that these LEDs are not the best quality. The solar panel included is very disappointing. It has a max wattage of 0.55, not even 1 watt. While it doesn't give us a percentage for the conversion rate, just looking at the low wattage is disconcerting. Some people may miss the dim mode for the lights, however the absence of the dim mode means the lights will last much longer. While the solar panel may be a bit disappointing, the Baxia Technology outdoor solar lights still seem to be a very reliable set of lights. Their motion sensor technology has no shortcomings, the battery is capable regarding the lighting mode, the brightness is good enough, even considering the amount of lights. These are great and reliable motion sensor lights. But the lack of other modes does not make them good for much else. These lights are definetlty worth your money. They are reliable through any weather, and will easily last throughout the night. Though they may need longer sun exposure to charge all the way. Right now you can pick them up for $27.99 on sale from $59.99. You also get a pack of 4, which is always cool. For more information, check out the rest of Green and Growing. Here are some top questions that I found for people seriously considering buying the Baxia Technology outdoor solar lights. Do they need charged before using them for the first time? No, they come pre-charged. Is there any other constant light setting? No, these only use the motion sensor. How do you turn them on? There is a key pin that you have to insert to turn them on for the first time. After that, they are totally automatic.